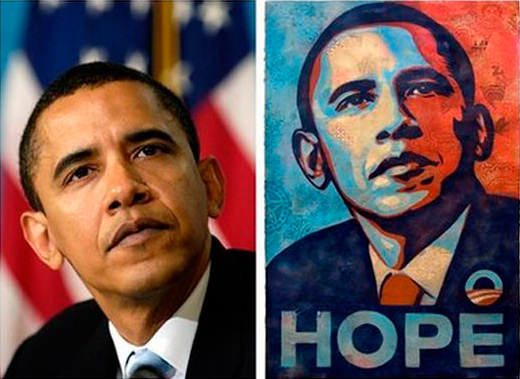 Artist Shepard Fairey has received a sentence of two years’ probation and a $25,000 fine in the Barack Obama/Hope poster case. Fairey had used an Associated Press photo of Obama, taken in 2006 by photographer Mannie Garcia. He had given no copyright credit to the photograph and destroyed incriminating evidence. He was lucky to avoid jail time. Fairey also had to pay $1.6 million compensation to A.P. and presumably court costs on top. See The Guardian for details. Shepard Fairey first came to attention in the 1990s through his Obey the Giant street art which became a sensation. He has turned that success into a multi-million dollar business ( $7 million in 2009) employing over 100 people. The photographer, Garcia, has been lost in all the controversy but he is a story himself. He was nearly killed by flying shrapnel while photographing the 1988 Ramstein air disaster, covered wars in Somalia and Bosnia in the 1990s, and in 2011 was roughed up by Maryland cops while shooting a police incident. Perhaps his most historic photo was the shot of President Bush looking down at the Hurricane Katrina destruction of New Orleans from the safe altitude of Air Force One. I remember that one. It helped to destroy Bush as president. You could say without exaggeration that Garcia directly helped to get rid of one president and elect another. That’s a story.